Banner Medals – The Parr family from Incredibles 2, including Mr. Incredible, Mrs. 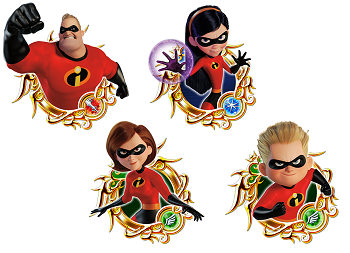 Incredible, Violet, and Dash, are now available as powerful new Medals. High Score Challenge – Keyblade wielders can climb up the rankings in this special event to receive “Bob & Jack-Jack” Medals. VIP Rewards – “Incredibles 2” Medals can be obtained by purchasing the Weekly Jewels Extravaganza bundle. Additionally, now through August 9, 2018, players can band together to challenge the limited time KINGDOM HEARTS 358/2 Days event. By completing event goals, all players can earn up to 3,000 Jewels, a valuable in-game currency. With over eight million players worldwide, Kingdom Hearts Union χ[Cross] players uncover story elements from the earliest parts of the series’ history, as well as from the highly-anticipated, upcoming Kingdom Hearts III. Players can create their very own Keyblade wielder and adventure through Disney worlds with beautiful and stylized art, while interacting with a rich cast of memorable Disney characters. With the recent version update, the game now features a player vs player (PvP) mode for players to play with friends and compete for a position on the leaderboards and a chance to win rewards. This game is available now as a free-to-play app (with in-app purchases) through the App Store for iPhone and on Google Play for Android devices.